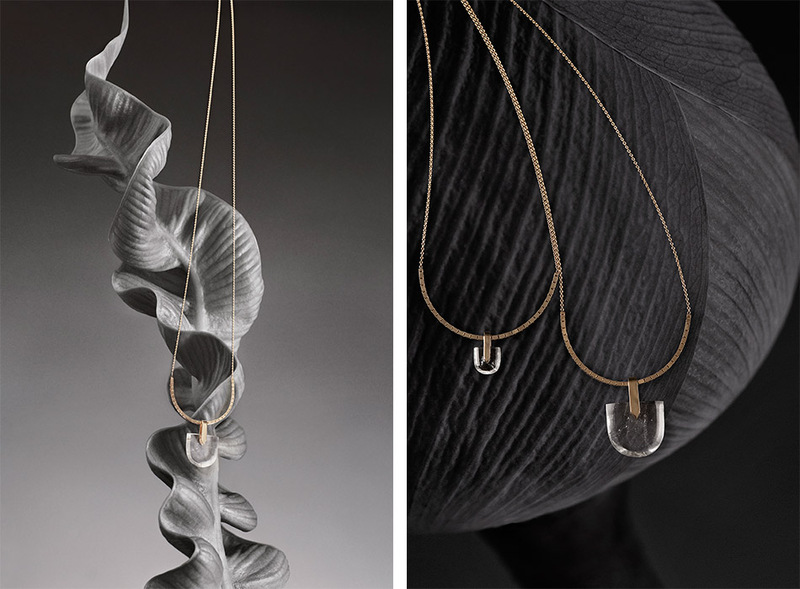 NYC based jewelry designer Bliss Lau is no stranger to seeking out inspiration. As the creator of her chic, eponymous line — which has been worn by a star-studded list of stylish women, including Beyoncé — and former handbag designer, the Parsons grad understands that some of the most creative and innovative endeavors often necessitate a deep dive into one’s psyche. And likely, there was no time Lau grasped this concept more than after the loss of her father and the discovery that she was expecting her first child. The emotions of this transformational time led her to create her latest collection, “Life.” Lau chose stones like black jade and crystal quartz carefully for both their energetic properties and their personal significance, making this new collection her most personal and autobiographical thus far. The release of “Life” was even strategically aligned with with the birth of the designer’s brand new baby girl, Soa (born September 11th). Knowing that motherhood and the cycle of life is such a significant source of inspiration, as well as a powerfully transitional time, we wanted to learn more from Lau regarding the ways being a mother has already changed her, what she loves about creating jewelry versus other mediums, and how she may have once ticked off her mentor, Tim Gunn. How did you make the move from designing handbags to jewelry, and what about making jewelry has resonated with you? One of the most potent elements of being a fine jeweler is the idea that each piece we make will last longer than we will. I love knowing that I am making something that can become an heirloom, made from the earth and recycled materials, that will be treasured and worn everyday by someone. Jewelry is the encapsulation of emotion, be it your love for your partner, a memory of a loved one, or in the life collection’s concept: your birth experience. I love the strength of what jewelry is as a talisman. Okay, we're fanning out about you having studied at Parsons with Tim Gunn? Any Gunn-isms you can share? We loved him so much in college, even before he was famous. He had a perfect suit on every day and always said the right thing. I wasn’t terribly good at following rules and I think he liked me for that, to a certain degree. I was very independent and wanted to do a course on my own, so he worked with me on an independent study class. I had come to the conclusion that I wanted to make handbags. I pitched him my senior thesis: a series of 10 bags. I was so excited and passionate. This was life or death to me at the ripe age of 21. I had poured my soul in to the collection. The bags were inspired by musical instruments; I made them only gold and copper lambskin with gold plated hardware. He looked at me and said, ‘Bliss, this is fashion school and you will make clothes.’ That was the end of that. In defiance, I did the minimum amount of ‘looks’ of clothes (five) and draped multiple handbags and belts all over every model. I don’t think he loved me for that! Alas, I sold that thesis collection to Opening Ceremony, Bloomingdales, Takashimaya, and Fred Segal in the following years and later ran into him and he was absolutely lovely and so proud. Speaking of fanning out, Beyonce has worn one of your body chains! What other badass, beautiful, powerful mamas would you love to see in your pieces? I love dressing entrepreneurs. The celebrities are amazing, too, but a woman who has built something from nothing and followed her passion is at the top of my list of badass mamas. Before I launched the collection, Danielle Duboise from Sakara Life had her baby and she wore the Brevity pendant during her birth. Such an honor. I would be thrilled to see Amanda Chantal Bacon of Moonjuice, Jakki Liberman of Bumkins, Eva Chen, and Alexa Von Tobel (her Financially Fearless book is fantastic) wear my pieces. I would also love to see Ali Wong in the piece. And Jada Pinkett Smith. And Solange for sure. Going along with the theme of “life” in your new collection, can you tell us how your recent experience being pregnant effected the kind of work you make? The experience was incredibly inspiring. I spoke to a friend with three children who has a theory that every child while growing inside of her inspired her in an entirely different way — she would suddenly become obsessed with history or philosophy, and in the end her children’s personalities matched that exactly, as if their energy brewed inside of her during that time. For me I have been more creative in the past ten months than in years (or so it feels). This is why I was inspired to launch a collection the day I give birth, in celebration of this experience and also in remembrance of the loss of my father, which happened quite recently, as well. The duality of the closely felt cycle of life from beginning and end felt so powerful to me that I was compelled to create pieces that encapsulated the experience. Pieces that I can wear forever to remember the birth process and now I have the brevity series, and I could only think to call the collection life because there is truly no other word for what this is.